Instructor: James O. Westgard, Ph.D.
After registering or logging in, you can Enroll in this Course by clicking here. This course is intended to provide education and training in quality control (QC) to a broad audience of healthcare practitioners who perform laboratory tests in central laboratories, clinic or outpatient laboratories, and point-of-care settings. The emphasis is on statistical QC because this is the backbone of good laboratory Quality system, regardless of setting. Statistical QC is the gold standard for quality - a widely applied, powerful technique for detecting errors in test performance. Statistical QC is quantitative and definitively demonstrates the proficiency of analysts and operators, when the technique is properly implemented and the QC data is properly interpreted. This course will help healthcare practitioners implement and operate valid statistical QC procedures. 1. What's the idea behind statistical quality control? Participants will be able to describe the basic idea of statistical QC in terms of the variation expected in a measurement process. In QC - The Idea, Dr. Westgard shows how a histogram representing measurement variation is the basis for the QC chart. 2. How do you plot and interpret control results on a Levey-Jennings chart? Participants will learn to construct Levey-Jennings control charts with appropriate control limits, plot example control data, and interpret the control results. In QC - The Levey-Jennings Control Chart, Patricia L. Barry, BS MT(ASCP) shows how to do this for a cholesterol example. 3. Isn't there a simpler way to do QC? Participants will be able to assess the efficacy of electronic checks for monitoring the performance of a testing process. In QC - Electronic Checks and the Total Testing Process, Dr. Westgard describes the role of electronic checks in a Total QC system. Using the analogy to compare the total testing process to the "total driving process," Dr. Westgard shows that electronic QC can be seen as part of a bigger system, essential but not sufficient by itself. 4. What regulations govern the practice of QC? Participants will be able to identify the US CLIA regulations for quality control, as well as accreditation standards, guidelines, and checklists from the Joint Commission, CAP, and COLA. In QC - The Regulations, Dr. Sharon Ehrmeyer describes the US regulatory and accreditation requirements that apply to all laboratory testing, with examples of rules and guidelines from the deemed providers and accreditation agencies. 5. What are control materials and what characteristics are important? Participants will learn to select control materials that are appropriate for tests of interest. In QC - The Materials, Elsa F. Quam, BS, MT(ASCP) reviews the purpose of statistical QC and describes the important characteristics of control materials, such as matrix, stability, vial-to-vial variability, assayed vs. unassayed, analyte levels, and pre-treatement steps. 6. How do you interpret control data using a multirule QC procedure? Participants will be able to interpret control results with a series of rules to determine if patient test results should be reported and, if not, what type of analytical errors are likely occurring in out-of-control runs. 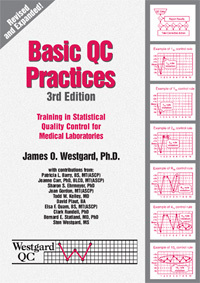 In QC - "The Westgard Rules," Dr. Westgard defines the rules commonly included in multirule procedures and provides the rationale for using multiple control rules to interpret control rules. 7. How do you interpret multilevel QC data? Participants will be able to interpret control results when multiple levels of control materials are being analyzed. In QC - the Multirule and Multilevel Interpretation, Dr. Westgard illustrates the interpretation of multiple rules with multiple control materials and multiple analytical runs. 8. What are the chances of run rejection? Participants will be able to identify the problem of false rejections caused by narrow control limits, such as commonly-used 2 SD control limits. In QC - Rejection Characteristics and Power Curves, Dr. Westgard explains the concepts of error detection and false rejection using the analogy of a smoke detector. 9. How do you solve out-of-control problems? Participants will learn to distinguish between good and bad habits for responding to out-of-control signals. In QC - The Out-of-control Problem, Elsa F. Quam, BS , MT(ASCP), identifies the bad habits of repeating control measurements and reanalyzing control materials and recommends alternative good practices for solving control requirements. 10. What are some common problems encountered while performing QC? In "But...Is it really out?" Doing the Wrong QC Wrong, Dr. Westgard and Sten Westgard discuss common "real world" situations with QC, out-of-control events, and errors in QC Design. In Ten Ways to do the Wrong QC Wrong, Sten Westgard examines user-submitted out-of-control scenarios and explains where the QC went wrong. 11. What documentation and QC records are required? Participants will learn to specify the parameters and information that need to be documented to make QC records useful for trouble-shooting and problem-solving. In QC - The Records, Patricia L. Barry, BS, MT(ASCP), describes the importance of documenting the "history" of a method to learn from past experiences. Good record-keeping is the ability to identify changes that may be the cause of problems. 12. What is external quality assessment? Participants will learn the characteristics of quality assessment programs like peer groups and proficiency testing. In QC - External Quality Assessment, David Plaut, BA, and James O. Westgard, PhD discuss the features of peer groups, proficiency testing, and the advantages and disadvantages of these programs. 13. What calculations do you have to perform? Participants will learn to calculate monthly QC statistics (mean, standard deviation or SD, coefficient of variation or CV) and control limits, as well as the cumulative statistics and cumulative control limits. In QC - The Calculations describes the equations used for calculating QC statistics. Dr. Westgard summarizes key QC points in QC - Do's and Don'ts Online course exclusive. In QC - The Frequently Asked Questions (FAQs), Dr. Westgard provides answers to questions from current and past course participants. Participants take a Final Exam. Those who pass with a score of 70% or higher are eligible for continuing education credits. Access internet resources to support continuing education and training in analytical quality management. Assess individual needs for QC training and education on the basis of responsibilities for laboratory tests. State the basic idea of statistical QC in terms of the variation expected in a measurement process. Identify the regulatory and accreditation requirements for QC for tests of interest. Select control materials that are appropriate for tests of interest. Calculate monthly QC statistics (mean, standard deviation or SD, coefficient of variation or CV) and control limits, as well as cumulative statistics and cumulative control limits. Construct Levey-Jennings control charts with appropriate control limits, plot example control data, and interpret the control results. Recognize problems with false rejections caused by narrow control limits, such as commonly used 2 SD control limits. Interpret control results with a series of rules to determine if patient test results can be reported and, if not, what type of analytical errors are likely occurring in out-of-control runs. Distinguish between good and bad habits for responding to out-of-control problems. Specify the parameters and information needed to make QC records useful for trouble-shooting and problem-solving. Perform a critical review of laboratory practices for planning, establishing, and operating a QC procedure. Identify QC planning approaches that are practical in service laboratories. Dr. Westgard [left] is the course coordinator and primary instructor. Other instructors include Patricia L. Barry, BS, MT(ASCP) [pictured center] and Elsa F. Quam, BS, MT(ASCP) [pictured right], who are Quality Specialists in the Clinical Laboratories at the University of Wisconsin Hospital, Sten Westgard, BA, MS, Director of Client Services for Westgard QC [not pictured], and Sharon S. Ehrmeyer, PhD, MT(ASCP) [not pictured], who is CLS Program Director and Professor of Pathology and Laboratory Medicine at the University of Wisconsin Medical School. You are not registered for this program. Pre-Test - How much do you know about QC? 1. What's the Idea behind Quality Control? 4. The Rules and Regulations of QC? 6. Multirule QC and "Westgard Rules"